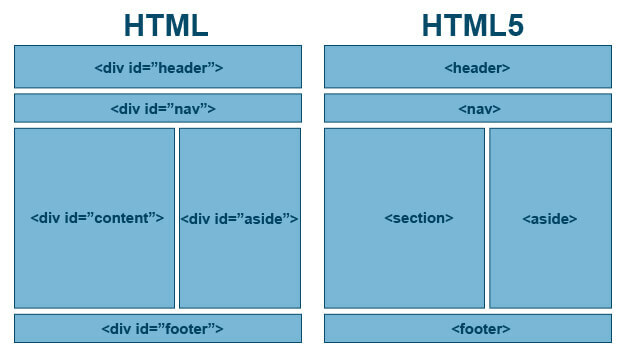 There are lots of difference between HTML and HTML5. HTML5 is the new version of HTML. HTML5 is more power full and easy than HTML, It have lot of new tags like <article>, <header>, <footer>, <nav>, <audio>, <video> etc. HTML5 added the new Form tags <datalist>, <keygen>, <output> etc. HTML5 support Vector Graphics also, new graphic elements are <svg> and <canvas>. New multimedia tags <audio> and <video> are integral part of HTML5. GeoLocation API in HTML5 helps identify the geographical position of user browsing any website. In HTML5 browser cache is used as web application cache, web SQL database, and web storage. HTML5 is supported in all new browsers. HTML Supported all old browsers. HTML5 is supported in all modern browsers. Audio and Video tags are not used in HTML. audio and video tags are used in HTML5 for multimedia. In HTML Graphics is done with the help of technologies like Silverlight, Flash etc. In HTML5 new tags are used svg and canvas for Graphics. In HTML, browser cache can be used as temporary storage. In HTML5 browser cache can used as web application cache, web SQL database, and web storage. Difficult to get true GeoLocation of user browsing any website. HTML5 GeoLocation API helps easily identify the geographical position of user browsing any website.